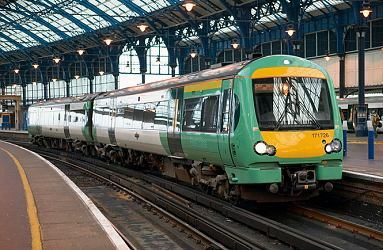 On Monday December 12th launched their promised direct service between Brighton and Ashford. 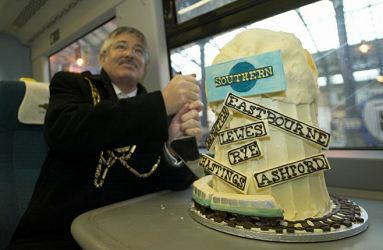 Following posing with the special cake, which was adorned with nameplates of the major towns served, Councillor Bob Carden, Mayor of Brighton, waved off the 09.34 departure to Ashford. Abord the train were representatives of local authorities Councillor Julie Carr (Leader of Lewes District Council), Councillor Graham Marsden (Mayor of Eastbourne), Councillor Pam Brown (Mayor of Hastings), Councillor Ian Potter (Mayor of Rye) and Councillor Norman Ayres (Deputy Mayor of Ashford). 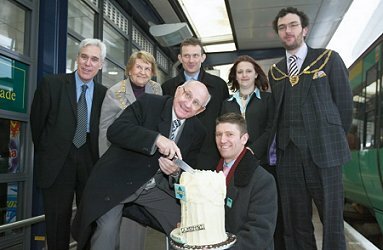 At Ashford, following distribution of the nameplates, 's Managing Director Charles Horton presided over a cake cutting ceremony. 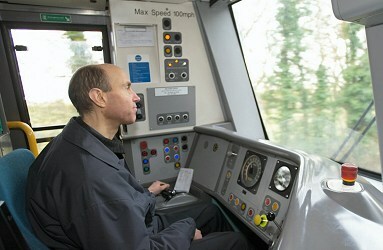 This new service has reduced the previous journey time by 35 minutes and with no changes of train. Although not stopping at all stations across Romney Marsh the new service provides a direct feeder service from the East Coastway Line to services at Ashford and in the future also for the fast London services which will use the Channel Tunnel Rail Link.